Capodimonte porcelain dates back centuries in age and a vast array of wares have been marketed under this name. The name Capodimonte, meaning "top of the mountain" in Italian, is apropos considering the first pieces were produced a hilltop factory established by King Charles VII.“The Capodimonte name was synonymous with the finest quality Neapolitan porcelain and ceramics from that period onward. 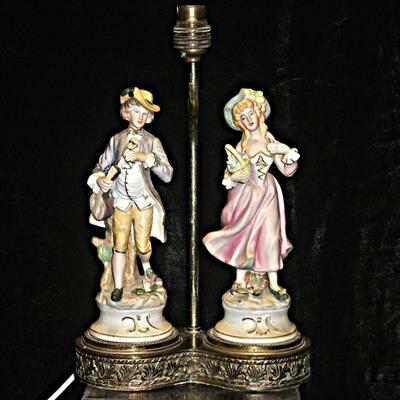 What modern collectors do find are mid-century electric lamps like the one illustrating this article figurines of varying quality, carefully molded arrangements of flowers, which are actually quite beautiful, and other decorative objects made during the last century or so. Some of these are rare and valuable in their own right, although they were produced in tribute to the original wares rather than by the "official" Capodimonte factories of previous centuries.